These filled Indian flatbreads are a good way to experiment with spices and flavours - you only need a tiny amount of filling and it is a good way of using leftover mashed potato or cooked vegetables. Parathas can be served alongside a curry or can be eaten with dips as an alternative to sandwiches in picnics or lunchboxes. Kid’s job: Place the flour in a large bowl and gradually pour in 125ml/4fl oz lukewarm water and the oil. Add a pinch of salt. Mix the dough together into a ball. Kid’s job: Knead the dough for five minutes- either in the bowl or on a clean surface. The dough should feel soft and stretchy and not too sticky. Different flours absorb different amounts of water, so you may need to add a little more flour or water if the dough is too sticky or dry. Kid’s job: Place the dough back into the bowl and cover with the cling film. Leave to stand for about 15 minutes while you make the filling. Kid’s job: You can make four different fillings in small cups or one big one in a bowl. Just mix together the ingredients you fancy and mash them up with a spoon or fork. Make sure you taste the filling and that you like it. Add a pinch at a time of pepper and spices, and taste. Kid’s job: Divide the dough into four, but trim and keep a bit to one side which you can use to fix any holes that might appear when you roll out the breads. Kid’s job: Roll out each ball on a lightly floured work surface or table. The dough should be about as thick as a pitta bread (approximately 5mm). Kid’s job: Place two tablespoonfuls of each of the filling mixture on the centre of the rolled doughs and gather the edges together so that the dough wraps around the filling. Kid’s job: Pat the dough to flatten carefully so that the filling is trapped inside. Roll out the stuffed parathas thinly as you can - don’t worry if some of the filling leaks out, you can ignore it or do a patch job with the extra dough. Adult’s job: Heat a large frying pan and then pour a teaspoon of oil onto the surface of the pan. Use a piece of kitchen paper to spread the oil evenly over the pan. Cook one paratha (or more if you have a large frying pan) for about three minutes on each side, or until it is starting to brown. Adult’s job: Repeat with the other breads adding a little more oil each time. You can keep the breads warm by placing them on a baking tray in a warm oven. Serve with yoghurt, dips or alongside a curry. 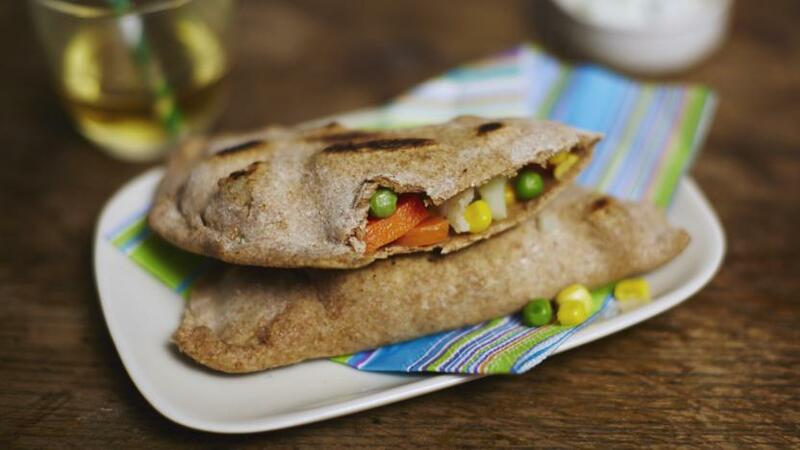 Cold parathas are also great for picnics or lunchboxes.